Sample Mary Queen of Scots Way on a self-guided walking holiday: the perfect weekend getaway. Accommodation, luggage transfer and custom holiday pack included. A shorter walk from Aberfoyle to Glendevon, showcasing the finest scenery and landmarks along the Mary Queen of Scots Way. The Mary Queen of Scots Highlights tour explores the first half of the trail from Aberfoyle – home to the Trossachs Discovery Centre – to Glendevon. This stretch enjoys stunning views across Loch Lomond and the Campsie Fells before following a selection of forest tracks, riverside paths and country lanes through the pleasant villages of Callander, Stirling and Doune – among many others – each with their own unique charm and stories to share. This walk also boasts plenty of opportunity to spot a wide range of impressive castles, ancient hillforts and old drover’s roads, which all offer amazing insight into the fascinating history of the Scottish lowland region. Spotting remarkable examples of Scottish engineering, from Victorian aqueducts to Gartchonzie Bridge, a grade B listed structure. Visiting well-preserved castles, including Doune Castle of Monty Python fame and Castle Campbell situated above Dollar Glen. Roving across Scotland and taking in fantastic views over lochs, glens, and mountainsides. Callander received a similar boost by Sir Walter Scott's work, as it, too, offers good access to the Trossachs. A larger, most spacious town than Aberfoyle, it hosts its own information centre and historic sites such as Tom na Chisaig, where one of the early Celtic saints is said to have preached to his congregation. 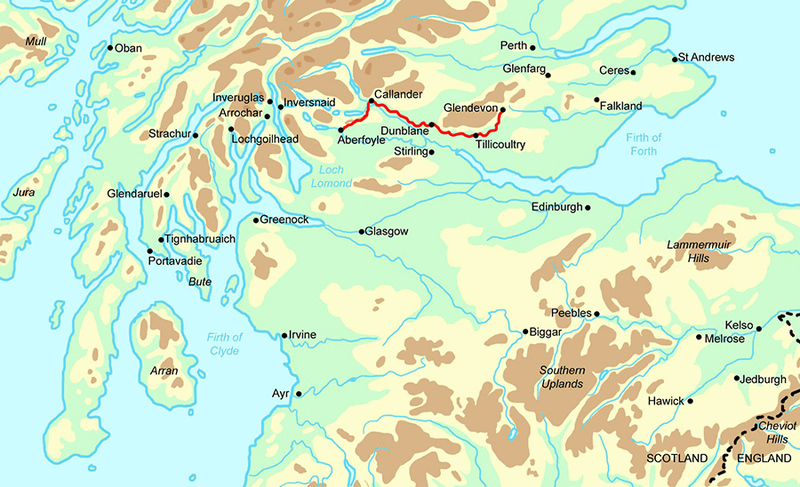 By Rail - The nearest rail station to the start of the trail (Aberfoyle) is at Stirling, approximately 20 miles away. A bus travels from Stirling to Aberfoyle. The nearest rail station to the end of the trail (Glendevon) is at Gleneagles (about 6 miles away). A taxi would be required from Glendevon to Gleneagles station. By Bus - Various bus services run to Aberfoyle. Return To The Start - The easiest way to return to the start of the trail is to take a bus from Glendevon to Aberfoyle.